The Cell Science Systems facilities spans out over 36,000 square feet with a breakdown of five specialized laboratories: Alcat Lab, Molecular Pathology Lab, Hormone/Antibody Lab, R&D Lab, and the Quality Control/Quality Assurance Lab. 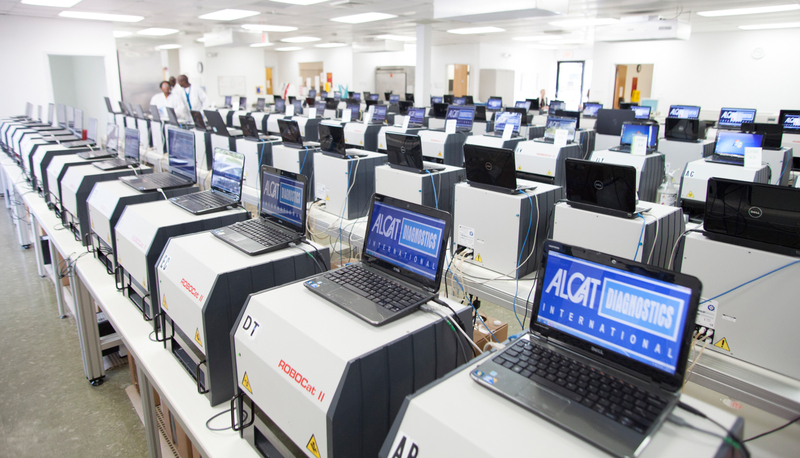 These labs are equipped with approximately 120 pieces of testing machinery and over 50 lab personnel. Machines are thoroughly cleaned and dried every single night before the next day’s lab procedures may begin. The machines are also run and tested every morning to ensure smooth, working conditions. With the luxury of the ROBOCat II machines being engineered by our own scientists, CSS has the ability to constantly be updating, maintaining, and repairing the facilities. Machinery is constantly monitored by all personnel within the lab via monitors located throughout the facilities.